I would recommend this set. I like soft feather and down pillows. Fall into a cozy, soft night's sleep with this set of two feather pillows. The white goose feathers provide luxurious comfort, and the 230-thread count shell keeps your rest soft and smooth. The double-stitched edges and tough cambric weave provides durability, so the softness stays around. You don't even need pillowcases, as you can keep these pillows clean with your washing machine. Down- and feather-filled products are packed tightly during shipping. Upon receipt, remove them from their packaging, fluff gently, and allow several hours to recover their full loft. In addition, being sealed in plastic packaging sometimes causes the scent of these natural products to concentrate to a disagreeable level. A few hours of airing usually removes the odor. I ordered two sets of the king size Jessica McClintock pillows for my new bed. When they arrived, I wasn't certain I received what I had ordered, because I received two boxes from "Downlight" - no mention of Overstock or Jessica. I had to research Jessica McClintock online to realize that these pillows are made by DownLight. Despite what other reviewes have stated, I'm not very impressed. The cotton that covers the pillows seems thin, and there are quite a number of lumpy spots in the pillows. I've had a lot of down pillows in the past, and these are some of the least comfortable. Nevertheless I'm keeping them. Considering the price I paid, they'll do for now, and I'll look for better quality next time. 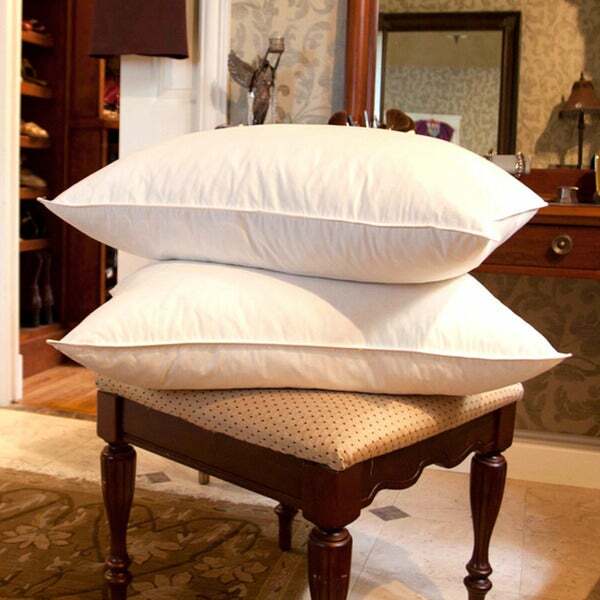 White Goose Feather Pillows are great quality. Fluffy and comfortable to sleep on. Cozy Cotton White Goose Feather Pillows (Set of 2)- great pillows - not cheap but worth the money - very comfortable not too soft or hard almost perfect - Pillows are very important to me I suffer from neck issues if the pillows are not right - so far not one issues - very well made and shipping and packing were good. I received my order of four pillows this week and because I was waiting for the covers, i fluffed them out and allowed them to relax and air out for two or three days. Once I received my covers, I fluffed the pillows again and noticed something disturbing, a cloudy mist! I didn’t see this cloudy mist the first time I fluffed the pillows so IDK. Yes, these pillows make a crinkle noise when I lay on them but but it’s not something that would make me stop using them and I have not experienced any side effects from the cloudy mist. These pillows are not as firm as I would prefer but they are not lacking fullness! I cannot detect a filler in these pillows either. Overall, they’re a good purchase. Just an update 4/3/2019 I have been sleeping and propping myself up on these pillows for several weeks now and I just noticed I don’t hear the crunchy noise anymore, not that it was unbearable in the first place! Originally I gave these pillows three stars but I changed it to five stars today because they really are great. I haven’t experienced flattening or feathers sticking through. I treat these pillows the same way I treat all goose feather pillows; I punch them after work! This is a great way to airate them and a great stress reliever! I love these goose feather pillows. I ordered the king set. The are wonderful. They are firm yet soft and keep their shape. Highly recommend. They are worth the money. These are very nice quality goose feather pillows. Love the pillows! My husband has cancer and doesn’t sleep very well and all night long goes from switching pillows to pillow or no pillows so I started looking at feather pillows. Since receiving pillows he is sleeping better and hasn’t switched pillows during the night. In his words, said gravity is pulling him in and sleeps much better. Definitely worth the money and the much needed rest he needs during this time. Thank you! Wonderful set of Goose feather pillows! As I was looking to fill my decorative shams, these feather filled pillows were the perfect solution. They delivered a soft, full, fluffy fill for my shams filling them out entirely and giving me the luxury look I was after. I used them to fill my Restoration Hardware bedding and I am very pleased--thanks Overstock!! I should have known, because of the cheap price, that they would be terrible. Follow the old adage-you get what you pay for. You can feel each and every feather spine through the covering. I did keep them but I have to make a quilted covering to go over them. You can still feel the spines but it would have cost $**.00 to send them back. I think there are some items you just can't buy online and feather pillows are one of them. Pay more money-you will be happier with the product-don't buy these. I returned these pillows. I did not find them firm enough. Did no impress me. they were no as firm as my old ones. They did seem nicely made. the were advertised as JUMBO, but were not. These pillows are very comfortable. The pillows hold their shape. I would always have to turn my old pillows multiple times during the night. They are very comfortable and I would definitely recommend them to others. I have always had down pillows. "Goose Feather" is NOT down. The feather quills poke like small stiff sticks against your face and hands if you touch them. these pillows are very comfortable. they keep their shape well. they can be washed and that is a plus. I would recommend them to anyone. When I first pulled these out of the box, I thought, "Score". I immediately forgot how much I paid for them. They are incredible. Beautiful fabric, high loft, soft and cushy. Attention was paid to the detail; all of the stitching is perfect. No leaks, no pokey feathers. They are so puffy that I had to cram them into my king-size pillowcases. Treat yourself! Everybody deserves new pillows every once in awhile. As always, quickest shipment from Overstock. These pillows are pretty good. The pillows are pretty comfortable. They are a little more heavy on the feathers than down which can feel rough until you use them and fluff them for a few weeks. Price was very good. Wow, I've owned these pillows over 4 years now and they wash so well and are just as fluffy and comfortable. I will definitely be purchasing more! These pillows are so comfortable. I will send another review after I've used them for awhile. I would like to see how they stand up after a period of time. For now I give these pillows and excellent rating. It's hard for me to find a good pillow, I have had surgery on my neck and I have a stiff neck in the morning usually. After a couple nights of using these pillows My neck isn't stiff like it was before. Well made, compared to other feather pillows I've purchased over the years. They are, however, used only as a decorative set on a king bed. Both have remained in shape and show no signs of loose or poking feathers. We Absolutely Love our new Whit Goose Feather Pillows. They are very Comfortable and We've been sleeping much better. No Neck aches when I wake up. Would Definitely Recommend. I Love the warmth and *realness* of Down bedding. In High School my eldest daughter would get SO upset If Feathers were on Her & i would löl Everytime .. I was hoping that I would get a quality product considering the price point. The pillows arrived rather quickly, but that was about the only positive. Out of the box they were fluffy but they were flat after only 2 weeks of use and they stayed lumpy in certain areas. I wouldn’t order again, but I did replace the pillows after a short time but I still have them stored for when guests stay. "Do they go flat like down pillow? How many oz of filling? Will they fit standard pillow case?" No. They are Medium Firm and feather and down. They should not be flat like an all down pillow. They have 32 oz of fill in Jumbo size. These measure 20x28" so pillow case for standard is likely too short. Need ITEM#: 19213037 which has jumbo size or 20x32 pillowcase. "Has anyone tried machine washing these pillows in a front loader machine on "gentle?"" Hello arizlady, we can appreciate the fact you want a firsthand account of the product. You will receive an email notification every time you get a response. Thank you for shopping with us. I need some new pillows as mine are flat. By the star rating I hope these are very good pillows, I need them.